Back in the early 1980s the following scene would have greeted you on entering Flinders Street Station. Thirty years later the view is similar except the CRT displays have been replaced with larger and brighter LCD panels, the wall tiles have changed colour, and you’ll need to hand over a bit more cash at the ticket windows. The 1980s photo is from a website dedicated to the supplier of the display equipment, AWA Rediffusion. The company was formed in 1970, as a joint venture between the Australian telecommunications and television equipment company AWA (Amalgamated Wireless Australasia), and the British broadcasting equipment company Rediffusion. Throughout the 1970s and 1980s AWA Rediffusion was involved with many similar projects in Australia, including television data displays at racetracks and airports, as well as the CCTV system on the Sydney Harbour Bridge. 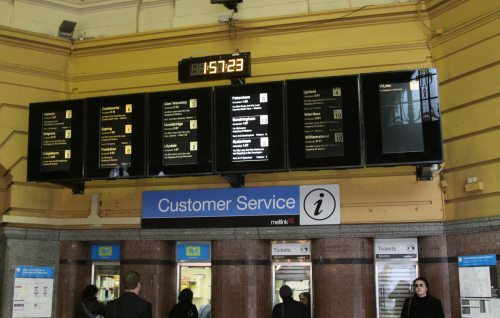 Of a similar design to the screens seen in the City Loop, the electronic displays at Flinders Street were the first of their type on the Melbourne railway network. According to an article from a contemporary issue of Newsrail, the screens at Flinders Street were first turned on in July 1980. 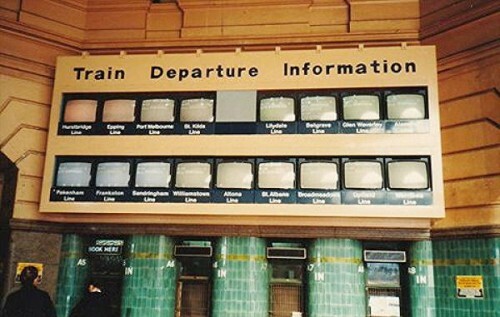 Replacement of the CRT displays at the main entrances to Flinders Street occurred sometime in the late 1980s or early 1990s, with much bigger “airport style” Solari split-flap display boards being installed on the main concourse, as well as the Flinders Street and Elisabeth Street entrances to the station – here is a picture of the unit in the same position as the earlier photos. As for the rest of the CRTs on the platforms, these lasted until the installation of the LCD panels in 2007 – a bit over 25 years. The airport-styled screens came in much later: early 2000’s IIRC. I’m guessing a late 1990s / early 2000s installation date would fit with the rollout of the PRIDE system (talking boxes) across the rest of Melbourne? I predict that the LCD panels won’t last as long as the CRT one’s. are the CRT’s in the City loop likely to be replaced any time soon? @Mitty – if you look closely at the photos of the LCDs you can already see the change in colour temperature between screens of different age, the newer units still have bright white text, while the older ones are going yellow.